Local governments in BC have worked over the past eight years to incorporate sustainability planning principles into municipal and regional planning processes, a reflection of their commitments under the Gas Tax Agreement. The Smart Planning for Communities (SPC) program, managed by FBC, offered advice and support, thanks to our team of sustainability facilitators. It was gratifying to see the good work communities have done over the years. FBC is always ready to support communities, large and small, in their quest to create more sustainable ways for people to live, work and play. The Smart Planning for Communities (SPC) program successfully drew to a close in 2016. The concept behind the program was simple: to help BC communities understand and undertake integrated community sustainability planning in a way that is consistent with each community’s vision for the future. With financial support from a number of partners, including the Real Estate Foundation of BC, SPC offered education, resources and advice to local and First Nations governments, particularly in rural communities. Communities have fulfilled their undertakings in various ways, some through stand-alone sustainability plans and others through Official Community Plans, asset management plans, climate change action plans or policy statements. An important outcome of the SPC program overall has been to foster good relationships between local governments, and between local and First Nations governments. In 2015-2016 we worked with six communities from one First Nation, several community organizations and two local governments as they worked to build robust and respectful relationships. As a partner in Learning Initiatives for Rural and Northern BC (LIRNBC), SPC found good opportunities for education and relationship-building. Encouraging the health and well-being of residents. Tools and resources for sustainability planning will continue to be available in the SPC section of the Fraser Basin Council website. 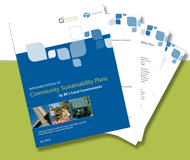 In the spring of 2016, Joan Chess of FBC’s Smart Planning for Communities program completed research on the implementation of community sustainability plans in BC and what communities see as pivotal to success on this front. The results of the review are wrapped up in the report Implementation of Community Sustainability Plans by BC’s Local Governments. Take a look!